The Mangrove Information Center Bonaire was first established in 2002 as a center where visitors could take tours into the surrounding mangroves. 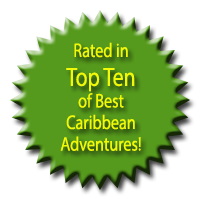 The Center offers daily guided kayak and solar boat tours through the beautiful mangrove forests of Lac Bay on Bonaire’s eastern shore. Mangrove forests are globally endangered ecosystems. They are also environments about which we know very little. Whilst mangroves around the world are threatened and many have been destroyed to make way for development or cleared for fisheries activities such as shrimp farming, the mangrove ecosystem surrounding Lac is protected both by local ordinance and as a wetland of international significance under the RAMSAR convention. The Bonaire National Marine Park actively manages not only the mangroves and sea grass beds at Lac, but also the island’s fringing coral reefs. 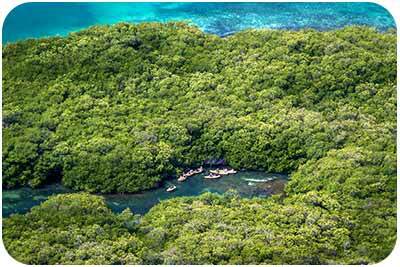 The mangrove forests at Lac Bay are unique in the Caribbean and are amongst the best-preserved in the region. There are three species of mangrove trees in Lac and as you tour the forest you will see why they are vital nursery grounds for all kinds of marine life, fish and birds. Between the mangrove forests and the barrier reef at the entrance to Lac there are large areas covered by sea grass beds. These are important habitats for juvenile reef fish, Queen Conch, rays, lobster, seahorses and a unique foraging ground for the region’s juvenile Green Turtles. The Mangrove Information Center offers visitors two eco-friendly options for visiting the mangroves, either by kayak or in solar powered boats. The Center has both single and double “sit-on-top” kayaks, which are easy to use, even for complete beginners. A solar boat is also available for tours, which is equipped with a special electric-driven outboard so there’s no noise and no pollution! Additionally two-hour kayak tours give guests the opportunity to snorkel in this unique environment: a real eye opener! All Mangrove Information Center staff are naturalists and qualified guides who have been certified by STINAPA Bonaire, the foundation responsible for the management of Bonaire’s protected areas. The tours guides not only help to ensure your safety and safeguard the bay, but they love to introduce visitors first hand to the magical world of mangrove forests. You will be given full instruction and guidance before you set off to make sure your visit is safe, fun and does not damage this very special and fragile environment.